BUYSOUNDTRAX Records presents BONE EATER, featuring music composed by Chuck Cirino for the 2007 horror film directed by Jim Wynorski (CHOPPING MALL, DEATHSTALKER 2, RETURN OF SWAMP THING) and starring Bruce Boxleitner (TRON, BABYLON 5), Clara Bryant, Jennifer Lee Wiggins, Jesse Janzen, Kristin Honey, Michael Horse and Adoni Maropis, along with Gil Gerard, Walter Koenig, William Katt, Jim Storm and Veronica Hamel. BONE EATER takes place in Sweet Water, Alabama. A greedy land developer is financing the development of a huge resort in the desert nearby. Tensions have flared between the developers and the local Native American tribe, the Kathonahs, over concerns that the resort is being built over the burial ground of their ancestors. The story begins as a construction crew discover a large bone axe while they are digging at night. When they remove the bone axe, they accidentally awaken an ancient Katonah demon spirit known as the Bone Eater and they are swiftly killed. The Bone Eater has superhuman strength and feeds on the lifeforce of its victims and leaves no trace of their existence, growing in strength as it feeds. Enter Sheriff Evans (Boxleitner) who arrives at the construction site to find enormous property damage and not a single body or piece of evidence to explain what has happened. That same day, his daughter, Kelly, has come from the big city to stay with him for the summer. As Evans tries to piece together what has happened, the Bone Eater continues its path of destruction through Sweetwater, leaving very little evidence in its wake, except for an ever increasing count of missing persons. Evans finds himself caught in the middle of a struggle between the Katonah tribe and the land developer, who is convinced that the Katonah tribe is responsible for his missing men and should be taken into custody. Evans himself is an unofficial member of the tribe as his father was a member of the tribe, even though he himself turned his back on the tribe a long time ago. As he gets closer and closer to his inevitable confrontation with the Bone Eater, Evans will have to make a choice between the Old Ways of his tribe or the New Ways of the Civilized World to break the ancient curse. An eclipse is approaching and if the Bone Eater is not destroyed before the eclipse, it will be impossible to imprison it again. 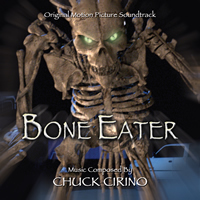 To score BONE EATER, director Jim Wynorski turned to Chuck Cirino. Longtime friends and collaborators, they have a working relationship that goes back to the mid 1980s, beginning with CHOPPING MALL and continuing with films such as DEATHSTALKER II, BIG BAD MAMA II, NOT OF THIS EARTH, THE RETURN OF SWAMP THING, TRANSYLVANIA TWIST, 976-EVIL II, MUNCHIE, SORCERESS I & II, CRY OF THE WINGED SERPENT, KOMODO VS COBRA, SOLAR STRIKE and many others. For BONE EATER, the composer has unleashed one of his most ambitious scores, a wonderful homage to composers Ennio Morricone and Bernard Herrmann,,tipping his hat to Morricone’s work on Spaghetti Westerns and Herrmann’s work on the great Ray Harryhausen fantasy films of the 60’s. Chuck Cirino did not start his career as a composer, but rather as a programmer in Stroudsburg, Pennsylvania for a Public Access cable TV station, where he learned how to create TV shows by himself, without a crew. In his spare time, he experimented with the station’s video equipment and created a series of genre productions that allowed him the opportunity to learn how to incorporate special effects into his work. After relocating to California, Cirino transitioned into directing high-end special effects television commercials. His first work as composer was for the 1980 cult film GYPSY ANGELS, which starred Vanna White and Richard Roundtree. Since then he has scored films for Roger Corman, directed music videos for bands like Earth, Wind & Fire and The Dickies’ KILLER KLOWNS FROM OUTER SPACE, and has recorded over 40 music soundtracks for feature films like SORCERESS, RETURN OF THE SWAMP THING, HARD TO DIE, TRANSYLVANIA TWIST, and many others. Cirino has worked as a producer, director, filmmaker, videographer, animator, special effects technician, editor, and composer. He executive produces and directs WEIRD TV, a television series featuring weird Americans, bizarre news, unbelievable events and outlandish skits. Chuck’s credits also include executive producer and director of the Sci Fi Channel projects, WORLDWIDE WEIRD and WARPED IN SPACE, and BABERELLAS, an independent Sci Fi feature distributed by Xenon Pictures. BONE EATER is a limited edition, with only 1000 copies being pressed. As a special offer, the first 100 people to order the package from the record label’s website will have their copy autographed by the composer and director Jim Wynorski at no additional charge.